Several people have asked if I had seen the full page ad in the New York Times purchased by 121 self identified “leaders” of the Presbyterian Church. The ad, Presbyterians: We Can do Better than Divestment, denounced last summer’s vote by the General Assembly to divest from three companies making profits from Israel’s occupation. I do not know if my friends hoped I had seen it or hoped I had not seen it. But for what it’s worth, I found it disturbing. I agree with much of what the “leaders” said in their ad. They claim a “deep commitment to a just and lasting peace between the Palestinian and Israeli peoples.” I certainly agree with that. They review the atrocities of this past summer and “long for justice for both peoples.” They hope to find the “true path” to a just and lasting peace for both sides.” Then, they denounce divestment as polarizing and declare that we can do better than that. All of that sounds wonderful. However it ignores the history, the facts on the ground and 66 years of Israel’s oppression. These refugees, many of whom have lived in camps their entire lives, yearn to return home. I hear nothing in the leaders aspirations for a “deep and relational work that models peace and reconciliation with justice and compassion,” that even hints at including the millions of Palestinian refugees. All Israel hopes for is that the church in the US will join them in pushing the refugees into miserable little separated camps where they can be forgotten. So, again, I agree. We can do better than divestment, But, the “better” I have in mind is that in addition to divestment the church could do a better job of speaking out for justice and speaking up for the oppressed. I can’t think of any people who are presently among the “least of these” more than the Palestinians. 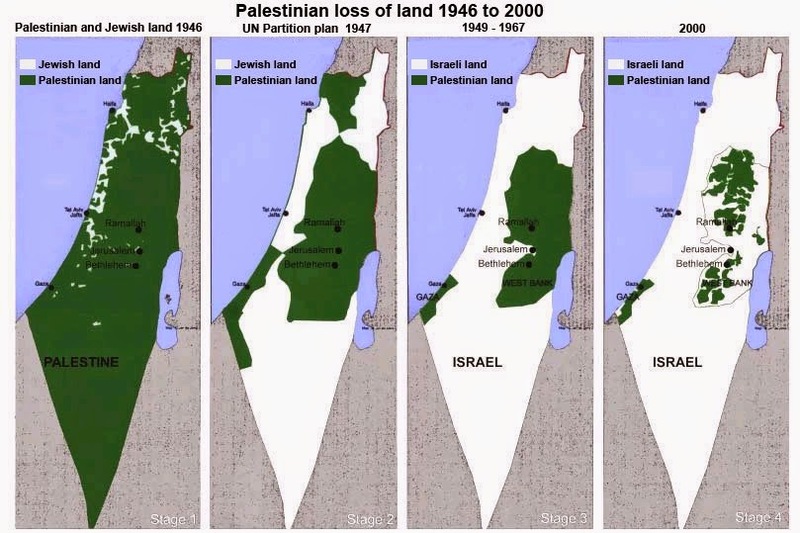 Israel destroys their crops until they are hungry. Israel steals their water. Their children are sick because Israel bombed their hospitals and clinics and blockades the import of medicines. Palestinians are not occupied because they are “the least,” they are the least because they are occupied. The two state solution to which the Presbyterian “leaders” commit themselves is no more than a cover up for continuing the theft of more Palestinian land and shutting Palestinians up in little enclaves, isolated from each other. It is a massive movement to ghettorize millions of people so that Israel might prevail as a nation for Jews with privileges for Jews only, such as Jewish only roads, buses and schools. The question which never seems to be addressed is, what would a two state solution look like for a Palestinian state? I would challenge my fellow Presbyterians to name just one policy or military action carried out by Israel, in the 66 years of its existence, which took seriously steps toward a viable two state solution, with secure borders. I wish the leaders would ask themselves why Israel, to this day, has never declared its borders nor adopted a constitution granting liberty and justice for all. The leaders talk about “shared resources” while Israel pumps 80% of the water out of Palestine for Israeli use and builds a wall around Qulqiliya, which sits on the largest aquifer in the West Bank. Israel is yet to show good faith, respect or acceptance of Palestinian human rights and promises no indication of doing so in the future. The “leaders” may be Presbyterians. I am also Presbyterian, but they are not my leaders. When it comes to working for peace with justice for the Palestinians, those who support divestment are way ahead of them. The plain facts from history and Scripture are that these so called "JEW" are of EDOM! They are trespassers and murderers! There may be a FEW JEWS that are in fact of JUDAH, but Gods word points to EDOM as being those that "say they are JEWS and are not. I am pretty sure that you have been presented with this before! If not, get the facts that I have presented at my site. The fact is JESUS was an "anti-Semite" and God said HE hated Esau/EDOM. And now EDOM has us blessing them as Gods Chosen when they are anti-Christs and to Bless anti-Christ's makes us partakers of their sins! Understanding EDOM is the key to understanding the New World Order! I have connected the dots becuase I did not rely on what I was told to 'believe' I II TIMOTHY 2:15 and I tried to 1 Thessalonians 5:21 Prove all things; hold fast that which is good. We are to think for ourselves as Paul pointed out! Thank you from the bottom of my heart for all of your blogs. With respect to this blog, you don't mention that there's been many a comment from right wing Likud members about driving out all of the Palestinians, that that is Israel's main goal. The longer they can hold off peace talks, the better it is for them. Very people have ever heard of the Talmud as well. All this Quran bashing and no one ever speaks of the evil Talmud. Since you put it first before America. No Don you're completely wrong. Amerika puts Israel first ahead of her own citizen as evidenced by all the proxy wars that benefit Israel and not Amerikan citizens. How is it that there is no mention here of the contents of the HAMAS Charter and the famous "from the river to the sea" dictum? Is the omission deliberate? What else ars an oppressed people suppose to do? You seem to forget that.